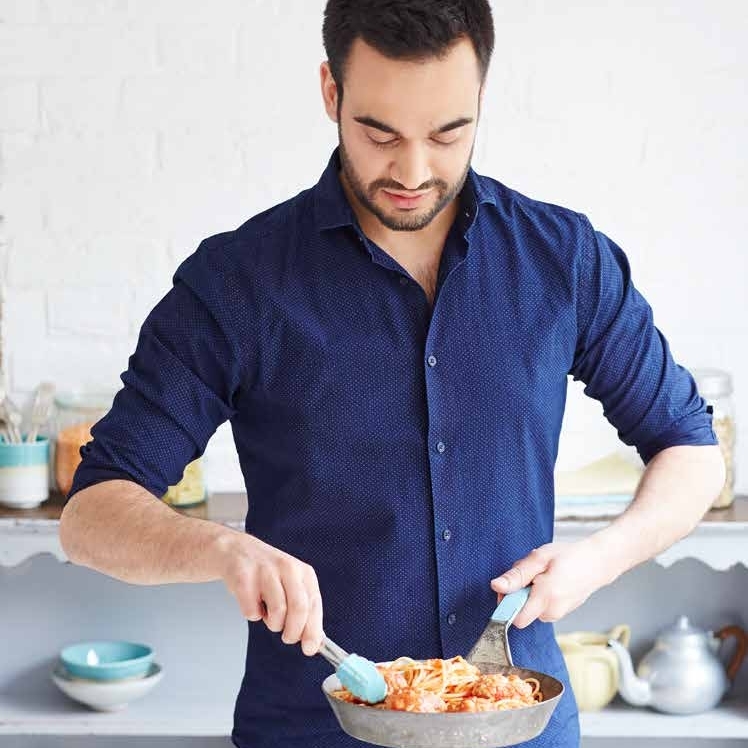 Recently I had the pleasure of taking to the stage with Joe Wicks, Jasmine Hemsley, Sarah Wilson, and Jessica Sepel during our publisher's How to Eat Well tour. Sammy from The Third Place caught up with me before the event for an interview. Read on to find out my thoughts and personal food journey. Sammy: Can you tell me about your relationship with cooking? Lim: It goes back a few years actually to when I was 18; I finished school and moved to Edinburgh. My aim was to get some experience in kitchens as I wanted to become a chef. And then, I found myself doing a degree in furniture making [laughs], so I swapped one sharp tool for another sharp tool, but still continued to cook. After the degree, I came to London and took a loan to do a Masters. I set up a furniture company with a friend, but any sales we got we had to put straight back into the business. We were taking home about £900 a month living in London, whilst trying to pay off Masters debt, so that’s where the idea of eating well on a small amount of money came about. It was a totally necessary thing for me at the time, you know? What is it that they say? Necessity is the mother of all invention, or something like that. So I was learning how to cook and eat on the cheap, and my housemate at the time said “I think you should start writing some of these down”. I left the furniture world around three years later to set up an ecommerce company selling design products from British makers – totally, totally failed! I think I made £411 that year, it was nuts. At that time, I thought “Well, if I’m in this position, there must be a lot more people like me”, and that’s how it sort of kicked off. S: Has eating well always been important to you – keeping those those small budget recipes nutritious? L: Yeah, absolutely. I think one of the questions people always ask me is “But is it actually good food?”, because it is very easy to eat cheaply if you just buy rice and spaghetti all the time! It’s doable but it’s not healthy and there’s not going to be any variety, so that was one of the main reasons for the book; it was to show people that actually, you can eat really great food and a massive variety, some succulent meats and nice vegetables… it’s all in there on a small budget. S: What would you say is different about what you are doing with budget cooking and recipes compared to previous budget recipe books? L: I’m looking at food from a top-down view; it’s not just about money, it’s also about time, confidence and knowledge. These four key obstacles get in people’s way of eating well. Whilst some chefs might price per meal, in my opinion it’s not the right way forward because if that recipe needs one whole chicken, a pinch of salt or teaspoon of curry powder, the cost to buy all of those ingredients is going to cost way more than the headline price of 82p a meal. It’s about eliminating all of the barriers to good food, and everyone is different. For some people, it’s about the money side and for some people it’s more work, travel, getting home at 8 o’clock and wanting to make something in less than half an hour. 85 out of 100 recipes in the book take between 5 and 30 minutes, but you’ve still got your tagines, roast chicken, tray bakes and things as well (that take a little longer). One of the other differences is that each recipe has the original ingredients list, but I’ve also added a column of swappable ingredients in. It gives people options, and my hope is that if you use the book, and maybe you’re not too confident with what ingredients go together, you’ll start picking it up. S: I see that you endorse a lot of own-brand produce from supermarkets. Did that take you quite a lot of testing to come to that? L: Yes and no! I think most of the supermarket own brands have come on leaps and bounds in the last few years, and they’re winning awards as well. The difference between a £1 tin of tomatoes and a 29p tin of tomatoes – you know, maybe unless you’ve got super taste buds, you won’t notice a difference! S: I guess there is a big difference between own-brand produce and own-brand time saving products like jar sauces. What are your thoughts on those, do you tend to steer away from using these types of products? L: I do. I think they’re more expensive, firstly. I actually borrowed my housemate’s sauce a couple of weeks ago because we were going away for the weekend and needed something to eat quickly – it was just the sweetest, weirdest thing! It wasn’t good. I’m sure there are some really nice ones, but for the effort it takes to make a nice tomato sauce? It’s just better to make it. Two weeks ago, I really wanted a pizza. So I thought “Okay, I’m going to order a pizza. It’s going to take about 45 minutes to get to me and it’s going to cost about £12″… and then instead I just made one. It took me 25 minutes from scratch, and it was pretty decent. I think there’s a misconception that cooking takes such a long time and is labour intensive. S: What would you say your absolute store cupboard must haves are? L: Hmm, if I were to pick 5 that I had to have? It would probably be eggs because of their versatile nature – eggs are cheap, and free range eggs are cheap. Next I’d probably go for chicken thighs – they’re juicy, succulent, better for roasting and also fry really well. You can poach them so that they melt in your mouth, and then there’s the skin which you can crisp up in the oven! With the thighs you also have the bones, which you can make stock with, so it’s a triple win. Third would be soy sauce. It adds a big flavour, it’s versatile for soups, stir frys, seasoning and rice, or even making your own BBQ sauce with soy sauce, honey, ketchup and garlic. Fourth… would probably be garlic, and fifth would be a big bag of spring greens. Again, you can put these in soups, stir frys, anything. Those would be my go-tos. S: Can you think of an example of your most embarrassing kitchen disaster? L: [laughs] Oh there are lots! I think anyone that says they don’t fail in the kitchen from time to time is lying. I think pro chefs make food that even they think “What have I done?!”. You won’t always get it right every time. There is a key takeaway there about forgiving yourself when it doesn’t go right. It puts a lot of people off of cooking because they think about what happens if they get it wrong, and it’s okay to get it wrong – it happens. I did once accidentally put a kettle on a hob that was still hot… and completely melted it. I was cooking lunch for someone that was working for me and they said “Lim, is that kettle supposed to be melting?!”. S: It’s good to hear that even someone bringing out such an accessible recipe book, or really that anyone, can make a mistake. It could put people off who might not be frequent cooks. L: Totally right. And you know, recipes aren’t set in stone, that’s the other thing. I know some people say it has to be exactly that, but actually we all have different tastes and it’s more about making recipes to suit your tastes. I think that’s my goal. S: If you could only eat one thing for the rest of your life, what would it be? S: Your last meal, forever and ever. L: My last meal… a whole meal? I think I would probably have to go for some sort of Vietnamese dish. We had a Vietnamese BBQ with this beautiful sticky BBQ pork and a whole barbecued aubergine that went all smoky… yeah, something like that. S: Do you have any advice for people that maybe don’t enjoy cooking but don’t want to have to buy cheap ready meals, or want to keep the costs down within their household? L: I think there’s a sense of pride and achievement you get from cooking and it’s about drawing that out. Like I say, forgiving yourself if it doesn’t go completely right the first time and just accepting it, maybe trying again or moving on to something different. Maybe if someone is really inexperienced, it’s about finding just five recipes or a week’s worth and mastering them, cooking them and enjoying them. The other thing is, when you cook for someone else there is usually a fear over whether it’s going to be liked. But if it is liked, then there is a sense of satisfaction in sharing your cooking and your meal with someone. That is always a great feeling. Cooking together is another one. Lets say you’re a couple, and one of you doesn’t like or know how to cook – attacking it together, trying it together, can be a good way. What would you choose to eat for the rest of your life? Let us know in the comments below.